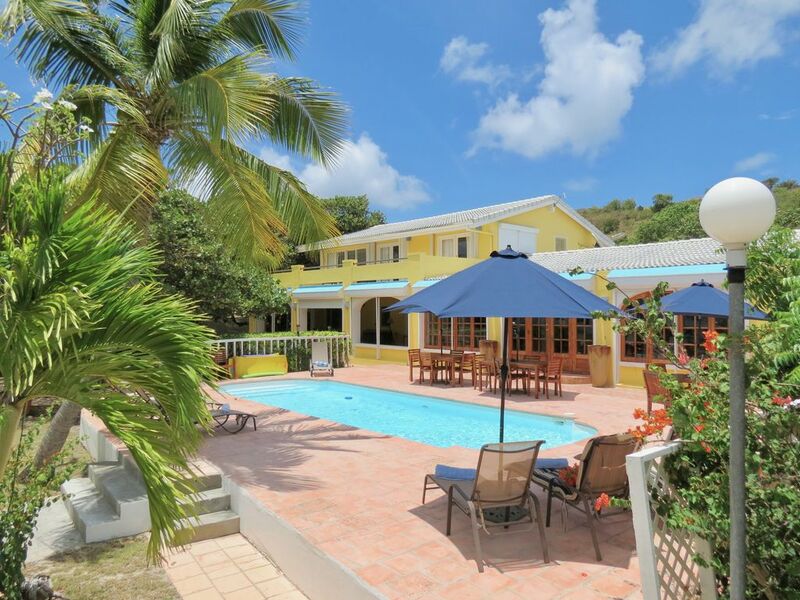 Cette maison en bord de mer est conçue pour la vie facile avec toutes les cloches et de sifflets nécessaires pour garantir des vacances fabuleuses sur l'île de Saint- Croix. Profitez de la pêche à partir de votre propre quai ou de se promener la plage au restaurant local ou tout simplement se détendre autour de la piscine d'eau douce et se détendre dans le jacuzzi. Cette villa de 6 chambres est idéal pour de multiples réunions de famille et propose des animations pour tous les âges. La salle de jeu est un véritable bonus !! Love the Beach House! Great location, love the beach, pool, hot tub, game room so many options to enjoy our stay! Buck Island view superb, and a must to snorkel at! Saved a bunch being able to cook and grill after our daily excursions! Definitely appreciate that! Great place, great vaca! "She ain't fancy, but she fun"
Just got back from a 6-day stay at The Beach House and it was amazing. Was perfect for our large group and Donna is the best!! When booking, you MUST rent a car if you stay here. All in all, great fun house! Thank you for coming. We are glad that you had a great time. booked this house and this was the first time I have ever used homeAway or any other air bnb type of site. What a great first impression. This house was amazing. There was a group of 12 of us so you would think that it would have seemed a little crowded but the house was so big that you had to look for the others in the house. Rooms were big in size and beds very comfortable, but you spent all of your time on the beach. The outside bar was really awesome and had propane or charcoal grills but just watch out for the noseeums or sand flies. make sure you have some off for those who react badly. Snorkeling was great, there is actually a sunken boat about 100 yards or so in the ocean that is not hard to swim to and it is not very deep as you can see the edge of the boat from the shore. In the sunken boat we found that they have a lot of colorful fish, lion fish, puffers, and a lot of little reef nibblers. The starfish are everywhere and it was fun to search for them. they're bright orange so it was kind of easy to see them on the grassy sea bottom. Conch and sea urchins were also fun to find. kayaks were available and some of our group went over to buck island and did a little snorkeling. The whole trip was fantastic. I would suggest renting a car. There is gas stations that has some food, booze and something to eat not to far away but the grocery store is closer to the airport about 30 min away. I would probably skip the all you can eat lobster crab night on Monday nights at the blue water terrace. We had a group of 12 and the table was to small and the service was not good. probably would have been ok with a party of 2 or 4, you would have gotten some attention. The house came with all the amenities and has an extra giant fridge and freezer in the laundry room so you could store ice for your entire trip. It had a few imperfections and couple of broken hinges on cupboard drawers and a bit dated that you can see in the pics but all in all, the majority of us would stay there again in a heartbeat. and we try to keep her well maintained so everyone has a great experience! boards for more beach fun! This review has been 3 months in the making! First off, Donna was AMAZING! She was extremely helpful, even allowing me to ship items to her office prior to our arrival. The house was everything we could've hoped for. We hosted a wedding with around 30 people and the house was perfect! So much space for a large gathering and amenities a-plenty - tons of beach towels, snorkeling gear, kayaks, beach chairs, tables, umbrellas, pool table, ping pong, board games etc. I could go on and on! The beach is also spectacular - having a private beach is always a MUST for our family. :) The grounds team is also terrific - Thor visited us every morning to take out the trash. He even helped us decorate the morning of the wedding. Bedrooms and the interior are also in excellent shape - plenty of TVs (although we didnt turn on any of them), seating, and comfy beds. The biggest surprise was the extra fridge in the laundry room! A huge benefit! The only strange thing was the lack of coffee cups - only 6 in the house. We really didn't mind, just thought it odd. The area itself is in excellent shape post-hurricane. Some downed power lines, but overall everything is looking great. About a mile down the road is Ziggy's gas station/bar/restaurant - excellent food, friendly people, and a good time! We did all of our grocery shopping at Seaside Market and Cost U Less - both very convenient and had everything we needed. Lets start from the beginning. The meeting at the airport with Doug was great. He was great and helpful all the way. The house was immaculate. We had the time of our life we will definitely return again. The pool the beach the Jacuzzi all was amazing. We even had a few visits from marly the next door dog. Situé sur la baie Teague juste une courte promenade Restaurant Duggan et le Saint- Croix Yacht Club. Pour les environ 4 miles au sud est de la Divi Resort and Casino pour le divertissement de nuit. Sainte-Croix Yacht Club à distance de marche. Christmas Rate $10,000.00 per week, 7 night minimum stay.